We keep cribbing about the pesticides used in agricultural practices and organic food is fast catching up. Something I see as a positive change towards our food habits of course. Natural methods of agriculture are the best and need to be revived, there have been great examples of it being sustainable in every respect. At the same time we should be aware that there are many food ingredients available naturally in organic form all around us. If you have a neem tree or a drumstick tree in your neighborhood you know that nobody uses chemicals for them and they are naturally organic. Similarly most of the coconut growing along the coastline of India is naturally organic for obvious reasons. Being aware of this and planting more useful trees in the neighborhood is what we should be doing, and of course protecting the trees which are already growing. Nature is generous and ready to give unsparingly, we just need to nurture it a bit.....just a bit. The drumstick tree in my garden provides an inexhaustible supply of nutritious greens and nutrition. I mean calcium, iron, phosphorous, Vitamins C and A. All good things at no cost. It's great for gout and rheumatism and is a tonic food. I use the leaves to make parathas just like methi parathas with just a handful of dry kasuri methi and nobody has been able to tell that it is drumstick leaves. Many people boil the leaves first and discard the water to make it more palatable (as many people do with bitter guards too), I feel that is unnecessary and wrong as the leaves can actually be tasty if cooked sensibly. The flowers are also used almost the same way. 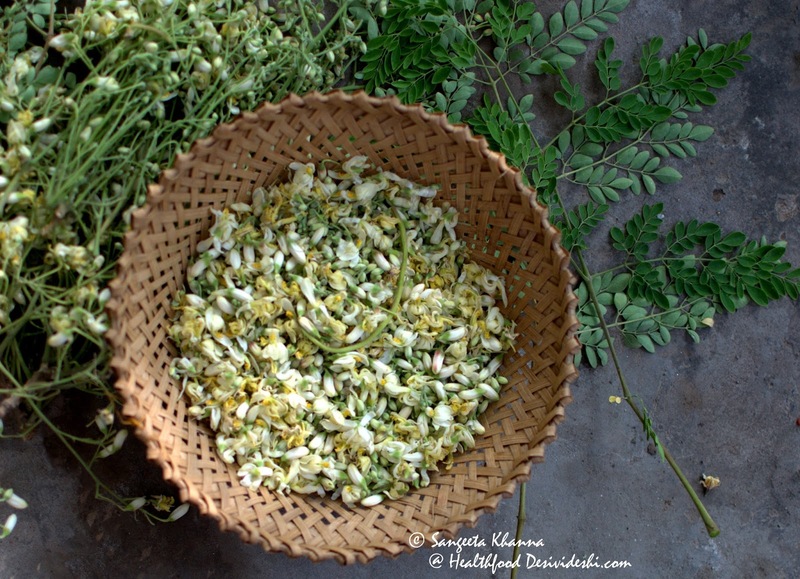 You can make curries or egg scramble with the flowers too. Apart from the usual daals and bhurjis and parathas I make from these nutritious greens, I came across a very interesting use of drumstick leaves. 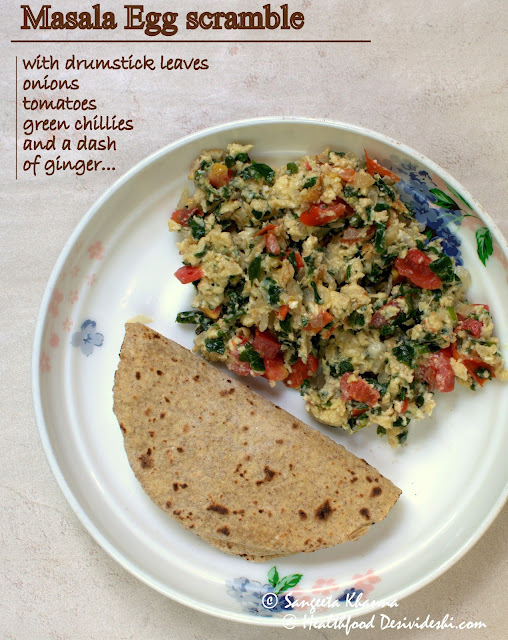 Found a recipe of egg bhurji here where he has used these leaves. Tried it the same day and it was just fantastic. Arvind loved it too and even said that this is one of the best way we can have it. Heat ghee in a pan and throw in the green chilies and onions and fry till onions are translucent. Add the drumstick greens, ginger and tomatoes along with salt n pepper to taste. Stir aand cook for about 4-5 minutes. Beat the eggs lightly and pour into the pan, keep the flame low and keep stirring the mix every 30 seconds or so. You can just cover it after one mix and let it set into a thick omelet too. For fluffier creamier scramble you may add a little milk too, about 2 tbsp. 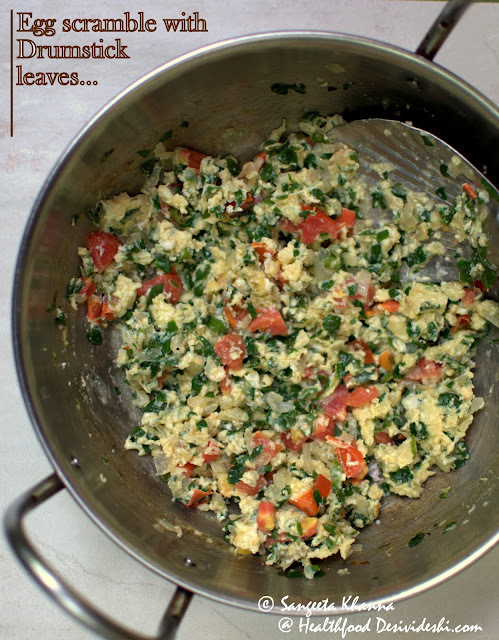 Remover from stove as soon as the egg scramble sets to your desired consistency. unusual greens : drumstick leaves in egg scramble.. 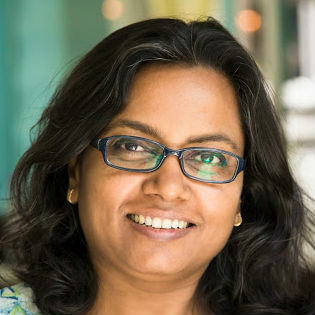 Thanks Subhashini ...that's really quick. I follow your blog regularly.Love your recipes and ur techniques...Thanks..Will be trying ur onion paratha soon.. Thanks Vini , your feedback is valuable for me . keep in touch and feel free if you have any queries. My Maa makes a beautifully aromatic dal with these greens. the bhurjee idea is great too. looks delicious. Drumstick leaves...that is another new herb for me....the egg dish looks so delicious! Very unusual! I'd love to try it! I used to eat a dal with this green, when I was Orissa. Very rich in iron content. We used to add drumstick to ragi and make a dosa out of it, with eggs. This makes me remember it.